My Mobiler is a cool little application which allows you free access to control your Android phone or tablet from your PC. While using your mobile device on your PC might not be exactly what you're looking for, it does allow easier access to functions on your phone which may take longer if you were to be using the touch screen display. With that said, My Mobiler comes with a Windows Explorer-like file manager which allows you easy access to the directory structure of your phone or tablet. You may move files with the drag-and-drop feature, perform system operations with your PC mouse and keyboard and control your phone completely via your desktop. Version 0.9.8.1 is a freeware program which does not have restrictions and it's free so it doesn't cost anything. 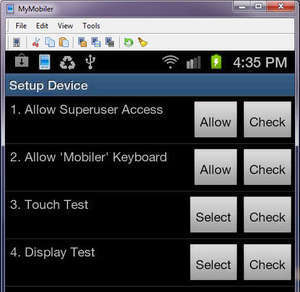 For security reasons, you should also check out the MyMobiler for Android download at LO4D.com which includes virus and malware tests. Additional screenshots of this application download may be available, too. MyMobiler for Android has a presence on social networks.